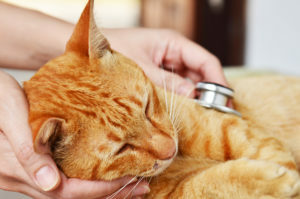 Do you know what to do when your beloved pet has an accident or a sudden medical emergency? It can be very stressful to both you and your pet but the first thing you should remember is to stay calm. At Stanhope Park Veterinary Hospital we offer an out of hours service to all of our patients. This means if you should need emergency advice or an appointment, a member of our caring team is on standby 24/7 to help your pet in their time of need. We understand that when you are concerned for your pet’s health, especially in an emergency, it is crucial to speak to a veterinary surgeon. Not only does Stanhope Park Veterinary Hospital provide out of hours call out to our Stanhope Road Hospital in Darlington, but our team of medical professionals are more than happy to advise you over the telephone. Whilst we understand that in certain situations, you may require us to come out to your home in an emergency, we would ask that wherever possible that you bring your pet down to the Stanhope Road Hospital. Not only are we able to see your pet more quickly, but we will have all equipment and medications to hand to treat your pet appropriately. Your beloved animals will be in safe hands at Stanhope Park Veterinary Hospital. We promise to provide your pet with everything they need to live a longer, healthier and happier life. For more information on our out of hours service, or to book an appointment with a member of our veterinary team, please call 01325 380111 or email Stanhope Park Veterinary Hospital at info@stanhope-vet.co.uk.